Happy Mardi Gras! New Orleans is going full force today for Fat Tuesday celebrations and parades. 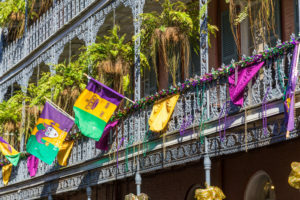 Gold, green and violet colors decorate the colonial French Quarter while parade float riders throw beads, cups, doubloons and other trinkets—a tradition since the 1870s. Tourism and annual spending is at its absolute highest in New Orleans at this time, and for good reason! The fun doesn’t stop from the First week of January all the way until the Tuesday before lent, also known as Fat Tuesday. Rent a timeshare in New Orleans to get the most out of a Fat Tuesday vacation celebration. Did you miss out on your chance to rent a timeshare in New Orleans? Don’t fret! There is still time to attend Universal Orlando’s Mardi Gras, which doesn’t end until April 4th. In order to explain the massive celebrations that we know of in New Orleans, we need to travel back in time to Medieval Europe. A prominent Carnival symbol in France tracing back to 1512, the Boeuf Gras (fatted bull) was paraded through the streets on Fat Tuesday. The first Mardi Gras celebration to reach the United States was when French-Canadian explorer Jean Baptiste Le Moyne Sieur de Bienville arrived at a strip of land approximately 60 miles south from New Orleans. When he and his men recognized their arrival was the eve of Fat Tuesday, Bienville named this land “Pointe du Mardi Gras” on March 2, 1699. By 1703, Bienville’s established fort “Fort Louis de la Mobile” celebrated the very first Mardi Gras in the United States. One of the most recognizable symbols of Mardi Gras is the elegant and ornate masks, used for hiding individual identities. In 1704, Masque de la Mobile was formed as a first secret society among the French settlers. Today, Krewes are the “secret” groups that are responsible for the Mardi Gras celebrations. By law, parade float rides in krewes must wear masks. While it’s origin is from a prominently Catholic background, Mardi Gras has become a more secular event celebrated by people of all backgrounds and religions. Anyone is welcome to celebrate the exciting and historic event. For the most authentic celebration experience, plan ahead with a timeshare rental for 2020, dress in purple, gold and green and get your mask on! Besides the awesomeness that is Mardi Gras, New Orleans offers so much history, tourism, cuisines and activities. Whether you’re going for Carnival season or just for fun, plan your must-sees and must-try events ahead of time so you don’t miss out on anything. The People Choice Award Winner at the King Cake Festival, Cannata’s King Cakes is known for making their king cakes from scratch—the right way. 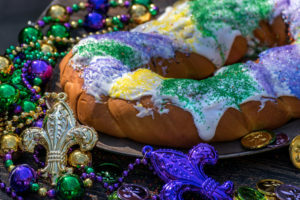 Offering 60 flavors like Strawberry Cream Cheese, Apple Cinnamon Pecan or the Tigerrrr Gooey Butter King Cake, Cannata’s is one of the best bakeries in New Orleans for this traditional Mardi Gras treat. Established in 1840, Antoine’s is one of the oldest family-run restaurants in the entire country. With three private dining rooms, each one pays homage to some of the oldest Carnival krewes. Walls are decorated with memorabilia, photographs, crowns and masks. Not including it’s Mardi Gras history, Antoine’s is also the birthplace of world-famous dishes like Oysters Rockefeller, Eggs Sardou and Pommes de Terre Souffles. Inside of the Arnaud’s Restaurant and open every day, this museum houses a great collection of Mardi Gras Carnival court gowns, costumes and other memorabilia. The best part—it’s completely free and open to the public. Daily brunch cruises on the Mississippi River can’t be complete without a live jazz band and authentic New Orleans cuisines. The newest sister vessel combines with Mardi Gras World for the ultimate behind-the-scenes tours of all things New Orleans Mardi Gras. Catch this attraction year-round. Traveling with the kids? No problem. Audubon Aquarium of the Americas is a great opportunity for the whole family to explore. Featuring a Caribbean Reef, Amazon Rainforest or its very own Mississippi River, educational fun is within reach. Kids will love the penguins, stingrays and various other deep sea creatures. New Orleans is also home to one of the top-ranked zoos in the country, Audubon Zoo. Have you ever seen a white alligator? This zoo’s unique exotic animals from around the world will wow you and the kids. The hands-on animal encounters are a must here as well. Hopefully, you are already settled with a great seat to watch the extravagant parades and floats this Fat Tuesday! 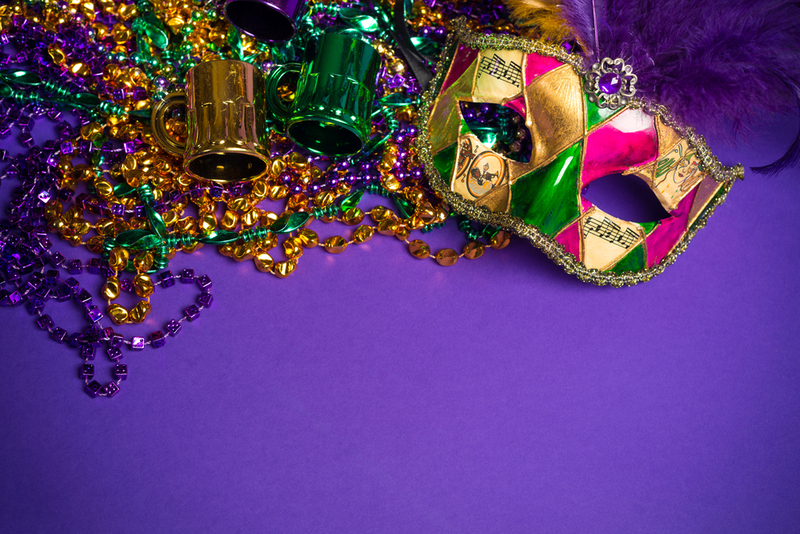 For those that have always dreamed of experiencing the Mardi Gras magic, plan ahead and save money with a timeshare rental in New Orleans. Stretch out in studio suites or multiple bedroom villas, complete with kitchens or kitchenettes. Get close to the excitement on Bourbon Street with luxurious amenities to make your trip that much more unforgettable. While most of the fun happens in New Orleans, Orlando brought a bit of Mardi Gras magic to Universal Studios. The event does not require special tickets, however, you will want to be early to the parks! Crowds get busy for the parades and concerts. Starting every night on February 9th to April 4th this year, Universal Orlando transforms into its own French Quarters. Enjoy authentic New Orleans live music, delicious Cajun food, and the same rides and attractions on top of the celebrations. Bummed to miss out on the New Orleans celebration? It’s not too late to head to the theme park capital of the country for Universal’s own event. Find a timeshare rental in Orlando and pack your bags for Florida’s own Mardi Gras. What’s best about Orlando timeshares is the vast amount of options from themed resorts, luxurious amenities or family fun.